The Fine Arts Society of Milton and 80 of its visual artists presented this mural to the Town of Milton on April 25, 2015. We celebrated our achievement of this uniquely collaborative legacy with a wonderful reception and media event. Mayor Gord Krantz assisted with this historical unveiling at the Mattamy National Cycling Centre – Milton Velodrome, where the mural will remain. 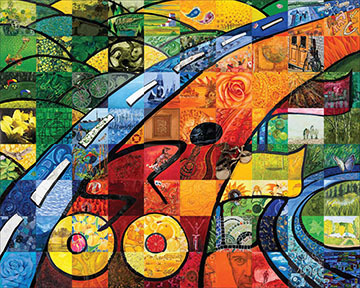 The mural represents the blend of sports and arts in a depiction of the landscape of Milton featuring a cyclist. The cyclist, the velodrome track, and the flags embody the spirit of the cycling events of the Pan Am and ParaPan Am Games of 2015, held in Milton, and the promise and determination of the athletes who use the Mattamy National Cycling Centre for years to come. Many thanks to the artists who participated. Each of the eighty 10″x10″ squares was painted by a different FASM member and then reconstructed into the mural by Aparna and Sanjay Rangnekar.